According to Chester’s lawsuit in the U.S. District Court for the Southern District of Texas, he suffered serious heart failure injuries after using Onglyza and Kombiglyze XR. Chester claims that he suffered severe congestive heart failure and respiratory failure, from Onglyza side effects. Onglyza (saxagliptin) is made by AstraZeneca. Onglyza was approved by the FDA in 2009, for the treatment of type 2 diabetes and is considered a blockbuster drug. Kombiglyze XR is a long-acting version that combines Onglyza and metformin, an older diabetes drug. FDA announces Heart Failure Warning for new diabetic medications, Onglyza and Nesina. Type 2 diabetic patients are at increased risk of heart-related complications from their disease and also suffer from life-threatening side effects from the newer diabetic medications. New type 2 diabetes medications Onglyza and Nesina linked to increased risk of heart failure and death according to FDA. Over the past several years, medications have been approved for sale that belongs to a class known as Incretin Mimetics and Dipeptidyl Peptidase-4 (DPP-4) Inhibitors. The FDA launched a safety review into the Onglyza heart risks in 2014, after a New England Journal of Medicine report, known as “SAVOR.” Researchers discovered an increased rate of heart failure hospitalizations in Onglyza patients compared to those given a placebo or a sugar pill. The FDA’s Endocrinologic and Metabolic Drugs Advisory Committee in 2015, noted that patients were exposed to higher hospitalizations for heart failure and death. In 2016, the FDA issued a warning, announcing that new heart failure warnings will be required for the diabetes drugs Onglyza, Kombiglyze XR, Nesina, Kazano, and Oseni, which are part of a class of medications known as dipeptidyl peptidase-4 (DPP-4) inhibitors. The active ingredients in these medications are Saxagliptin and Alogliptin. 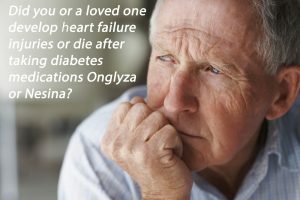 If you are diabetic and think you or a loved one may have developed heart failure after taking Onglyza, Kombiglyze or Nesina, please call us 888-210-9693. The Dr. Shezad Malik Law Firm is currently investigating and filing Onglyza, Kombiglyze and Nesina heart failure lawsuits on behalf of injured patients all over the U.S.